As the owner of Liepold Farms LLC, Larry is responsible for all animal wellbeing, feeding and capital to run a farrow-to-finish operation that markets 2,500 pigs annually. He also raises Boer goats and corn, soybeans, alfalfa and barley on 412 acres of land. 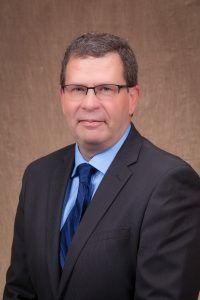 On a national level, Larry has been a National Pork Producers Council board of directors member from 2006-2012 and is a current member of the PORKPAC board of directors. He has also been active in the Minnesota Pork Producers Association. Larry is also an Operation Main Street speaker. What do you consider the major issue facing the pork industry today? A major issue facing the pork industry now is assessing and facing the disruptors that will adversely affect the market share for pork in the meat case. Things like addressing the environmental effects of production agriculture, meat-like protein meat substances, and social shifts away from animal agriculture are all included in this. What do you think should be the main goal of the Checkoff and National Pork Board? Regardless of the fine details of the current mission, including the majority of producers that contribute to the Checkoff believe in the original promotion, education, and research are the roles of the Checkoff. This means the goal of the Checkoff is to develop and initiate the programs that attach themselves to that structure. Why are you seeking this position? I am seeking this position because I wish to represent pork producers on the National Pork Board board of directors. I believe in the programs, work of the committees, and the wholesomeness of meat and, specifically, pork protein. I don’t care about size, of anything. I work for the individual.